Canning and preserving food is a rewarding and frugal way to create a reliable food pantry for your family. On the other hand, anyone who has put up food knows that it is a process in and of itself. It requires pre-planning, food preparation and above all fuel. Because jars must be sterilized first in order to preserve food in an environment where molds and bacteria cannot grow, your fuel consumption is doubled. However, you have options that may benefit your specifics needs. Did you know that there are certain foods that do not require jars to be sterilized? According to the USDA’s handbook “Home Canning: Principles of Home Canning”, empty jars used for vegetables, meats, and fruits to be processed in a pressure canner need not be sterilized. It is also unnecessary to sterilize jars for fruits, tomatoes, and pickled or fermented foods that will be processed 10 minutes or longer in a boiling-water canner. For all other foods, a sterilization method needs to be used. 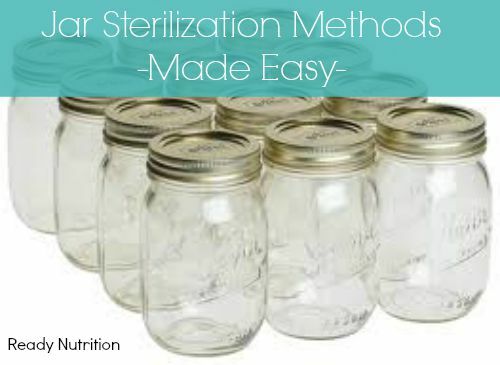 The sterilization methods listed below can help you customize your preferred canning process and in some cases, reduce your fuel usage. This method is great if you’re short on time. Wash the jars in the dishwasher and then simply leave them there until ready to fill. Keeping the door to the dishwasher closed keeps in the steam and heat. Remove the jars a couple at a time as needed. Place your jars in a canner right side up. Then, fill the canner with water, stopping an inch above the jars. Bring the water to a boil and continue boiling for 10 minutes. Reduce the heat and keep the jars in the hot water until you’re ready to fill them. If you live above 1,000 feet in altitude, add one minute of boiling time for each 1,000 foot increase in elevation. Preheat your oven to 225 degrees Fahrenheit. Make sure to adjust the oven racks to accommodate the jar’s height. Arrange your jars, lids, and bands on the cookie sheets. Leave space between them for the hot air to circulate. If you’re reusing Mason jars from previous years, remove the lids and bands from those jars so that everything is open and separated before you put your equipment in the oven. Place the cookie sheets with your jars, lids, and bands on them in your preheated oven. Set a timer for 10 minutes, and do not remove anything or open the oven door before these 10 minutes have elapsed. If more than 10 minutes elapses, that’s OK, but 10 minutes at that temperature is all you need. Turn the oven off and leave the jars, lids, and bands in the oven to keep them warm until you’re ready to use them for canning. Although 225 degrees is a comparatively low oven temperature, always use oven mitts or thick hand towels to handle anything you take out of your oven. Pre-heat the oven to 280 degrees Fahrenheit or 160 degrees Celsius. The hot oven will be used to dry the jars once they have been sterilized in the microwave. Fill jars halfway with cold water. Place the jars in the microwave. Depending on the size of the microwave, more than one jar can be sanitized at the same time. Heat jars in the microwave on high for around three minutes or until the water boils. The boiling water will sanitize the inside of the jar. Place jars upside-down in the oven. Allow the jars to drain and dry in the oven. Once the jars have dried and are still hot, they will be ready to be filled with preserves and sealed. Heating the jars allows them to expand so they will not break when filled with hot preserves. Whatever method of outdoor canning you use, make sure you have plenty of wood to burn in order to keep the heat high enough to maintain the pressure in a pressure canner or to maintain a hard boil in a water bath canner. Your method should allow you to tend the fire without moving your canning pot. You should also have plenty of heavy towels and heat protection for adding and removing your jars from the canner. Extreme caution should be used when cooking over an open fire. Click here to read more about off-grid canning. I’ve read that you should not try to can in jars that have been used to freeze items or if you have used them in the microwave. Supposedly they will break when used in the pressure canner. I don’t use mine for freezer or microwave so I haven’t had it happen because of that. Just wondering…. I want to try my hand at some refrigerator pickles, should I sterilize the jars or will hand washing work? You should definitely sterilize the jars before use. Also, if you plan on using garlic in your recipe, you should blanch it for 1-2 minutes in order to kill off any fungus or microorganisms that may be present on the garlic cloves. Jar manufacturers say NOT to put jars in the oven for any reason.